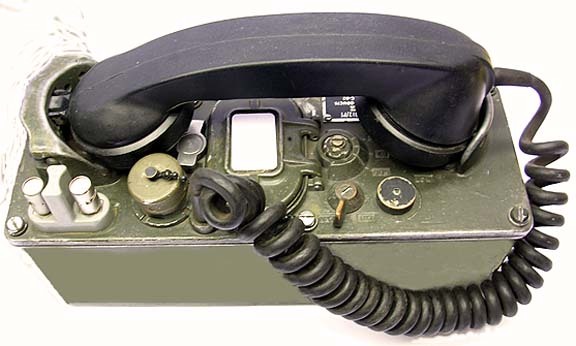 This is the TA-312 telephone set.While I was at Fort Lewis, we normally used these phones in the hand-dug bunkers around the perimeter of the encampment. WD-1 wire was strung from these phone sets and then tied down with a tent stake at the bunker, then strung to each of the bunkers and to the the Command Post (CP). This "Hot Loop" ensured that the bunkers could still communicate even if one of the strands to the other bunkers was cut.The "CP" had various patching capabilities on the outside of the truck that interconnected to the SB-22 switchboard inside. These phones were well suited for indoor use, but could be used outside when necessary. The TA-312/PT is a two-wire, battery operated field telephone. It has a range of 38 km using WD-1 wire, and was a successor to the EE-8 field phone used during World War II and Korea. Primarily used from 1950-1990, it was replaced by the TA-838. It's typically stored in a canvas bag. An optional TA-955 dual tone multifrequency (DTMF) adapter allows push button operational interface with automatic analog switches. * Strip away one-half inch of insulation from each strand of the WD-1 wire line. * Depress the spring-loaded line binding posts and insert one strand of the wire into each post. It doesn't matter which one goes where. * Adjust buzzer volume control knob to LOUD. * Turn the INT-EXT switch to INT (Internal). The TA-312 has the capability of either using the standard H-60/PT handset (INT) or an external H-144/U headset (EXT). * Turn the circuit selector switch to LB. (Local battery). * Insert the two BA-30 batteries into the battery compartment (one up and one down). Two D-Call batteries work just as well. * Seat the handset firmly in the retaining cradle. * Turn the handcrank rapidly a few turns. Remove the handset from the retaining cradle and wait for the other operator to answer. * Depress the push-to-talk switch to talk. Release the push-to-talk switch to listen. The Technical Manual used for the TA-312 is TM 11-5805-201-12. This site was created by William Caldwell for an IST 250 class project.